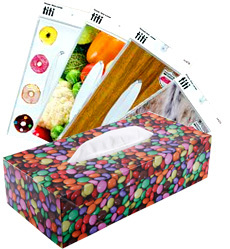 Want to dress a tissue box? Similar to a dress-up doll, you can dress a tissue box for various scenes such as a living room, kitchen, car, office, bedroom, and etc. A tissue box is a life necessity, however it sometimes distracts the home decor. Wood, cary or plastic cover that are ordinary used tend to be "heavy, disturbing, expensive and unchangable". Those complaints solved by special paper material of titi. There are various designs to fit for any situation. Titi made its debut with 24 designs in October 2009. It started selling at PLAZA, Tokyu Hands, Loft, and etc.